>>>This is a multi-unit set and the shipping cost will be adjusted, after your order is submitted to us, to that of 2 CDs. To learn more about the shipping cost, please visit our Help Page and look for shipping information. Yun Ho and Chang Min are making a comeback in both Japan and Korea in January! 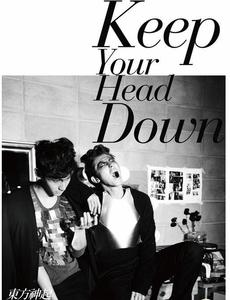 The first Korean TVXQ release in over two years, Keep Your Head Down features ten brand new songs that reveal a hot new image and style for Yun Ho and Chang Min. This Special Edition includes a 100-page photobook, a photo card, and a folded poster.